Most cookbooks recommend roasting pumpkin in the oven to remove the flesh from the skin. Roasting helps bring out the flavors of pumpkin. To prepare roasted pumpkin puree, you will need to cut the pumpkin into wedges and then place them open side down (skin on top) on a baking dish. You can cover the filled baking dish with aluminum foil to capture the heat. Place the baking dish in a pre-heated 350°F / 180°C oven. Leave to roast 30 to 45 minutes until you can remove easily the flesh from the skin and mash with a fork. Most times when I need pumpkin puree, however, I prepare it in a pot over the stove because I am too impatient to prepare it in the oven. I also find it easier to cook this way, especially if you are cooking large quantities of fresh pumpkin. Beforehand, I simply remove the skin with a knife, chop up the pumpkin in smaller pieces, and then cook them in a pot with a little water over the stove. It only takes a few minutes to remove the skin and another 15 minutes or so to cook the pumpkin. The pumpkin should be cooked just enough so you can break it down with a fork. However, if you use canned pumpkin you can of course skip these steps. A quick way to prepare Pumpkin Puree is to cook it with a little water in a pot on the stove. If you prefer, however, you can prepare Pumpkin Puree by roasting pumpkin in the oven. You will need about 1.67 x volume of raw pumpkin (without skin) or 2 x volume (with skin) to make 1 volume of pumpkin puree (strained). If you are using fresh pumpkin, remove the skin of the pumpkin with a sharp medium to large knife. 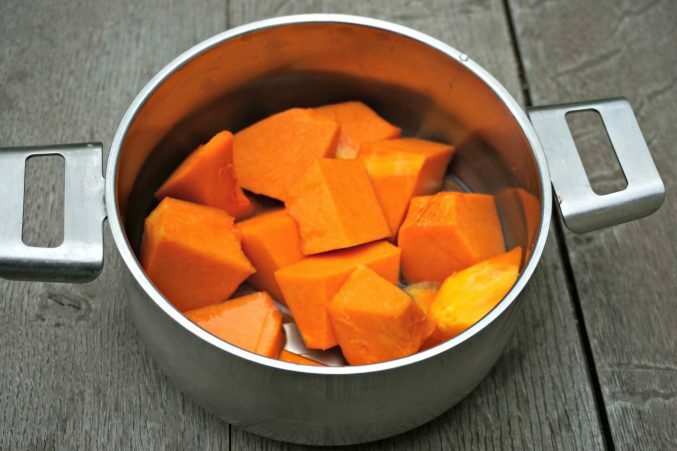 Chop the pumpkin into medium cubes and place in a casserole over a medium flame with a little water (1/4 cup). No need to add a lot of water here as the pumpkin will also release liquid as it cooks. Cover the casserole and cook for about 15 minutes or until the pumpkin can be broken down with a fork. Break down the pumpkin with a fork and then put it in a strainer over a bowl. Cover with a paper towel and leave for about 20 to 30 minutes to cool down and to drain excess liquid. Reserve the liquid for other uses, such as smoothies, sauces and soups. Cut the pumpkin into wedges. Place the wedges open side down (skin on top) on a baking dish. If you like, you can cover the filled baking dish with aluminum foil to capture the heat. Leave to roast in the oven 30 to 45 minutes until you can remove easily the flesh from the skin and mash it with a fork. You need about 1.67 x volume of raw pumpkin (without skin) or 2 x volume (with skin) to make 1 volume of pumpkin puree (strained).